What Are Your Food Goals for 2015? There are many foods and recipes I would like to try but haven't either through ignorance or laziness. I'm embarrassed to say that I have never smoked a brisket...so that's on my list. Cooking Lamb chops is another. What about other things like healthy types of foods you've never tried or even considered? This sub forum has really enabled and encouraged me to branch out beyond what is the norm. P.S. First and foremost I thank God that I had food to eat for breakfast today. I plan on doing my own chili, lamb chops as well, and trying out new veggie dishes. I need to lose a few pounds and have been very conscious, as of late, about my health. No real goals set, I will keep a open mind on the subject and try a few new things for me. Maybe a pulled pork for the BBQ, yeah that just made the list. I have a new shallow enamel cast iron Casserole in the post. There will be some new things for me cooked in that. Nothing special as far as particular foods go, just need to eat smarter to loose a few pounds to improve my health before the doctor puts me on another pill, I think 12 pills a day is plenty. If I had a food goal, it would be to eat some of the amazing things you guys cook. Food goals... to eat enough for satiation, but not enough so that I don't lose a few pounds... by choice. Yeah, good luck with that, I know. I have briskets to bbq, and 15 or so pounds of cheese to cold smoke in the short term goals. I was going to make some pastrami, but I can buy deli pastrami in the whole vac pac for $2/lb, so that's on hold. (corned beef [frequently] and roast beef[at times] as well) Right now I have a 7# pastrami thawed and ready for slicing in the shop refrigerator. My slicer is small. I'd like to have a large slicer now. On a bright note, my supermarket has gotten in a new supplier of pickled herring, and I'm an addict, but the new stuff is horrible. So I ordered 8# from Amazon out of Wisconsin. It's really nice stuff, so I'm in pickled herring heaven at the moment since it arrived today. Edit: FWIW the pickled herring is Bay View brand and I assume the herring is from Lake Superior. The date on it said use before 6/15. That shouldn't be a problem. I'll probably have a 2nd batch come in before then. I'd love to buy the locally sourced pickled herring, but I won't sacrifice quality for local sourcing... now if I can buy a mess of fresh caught local herring I'll make my own. (I'm salivating thinking about it) It's not difficult. I have been moving to healthier, local( when possible) foods too. The irony is what we call organic, cruelty free is what I ate as a child. Our eggs were miserable for baking and I doubt very nutritious. I started buying cage free, natural feed & fertile and the difference is incredible. I'm walking to our local 'Farmer's Market' to reduce shipping and packaging. MY carbon footprint is check balancing at least one trophy wife in her SUV Panzer. But food is as much culture and PLEASURE than mere nutrition. Doctor Oz can spin like a wirling Dervish. I want to learn more ethnic cooking after mastering rolling nori and pearl rice sushi. nutrition and need to connect with Phil for a beer and Chicago pizza or deli sandwiches. Wow...these are great ideas for 2015. Pickled herring sounds good as well as stepping up on the quality of eggs. Sometimes it can be something very simple. When was the last time you had a good corn dog. I don't remember the last time I had one....maybe 25 years. 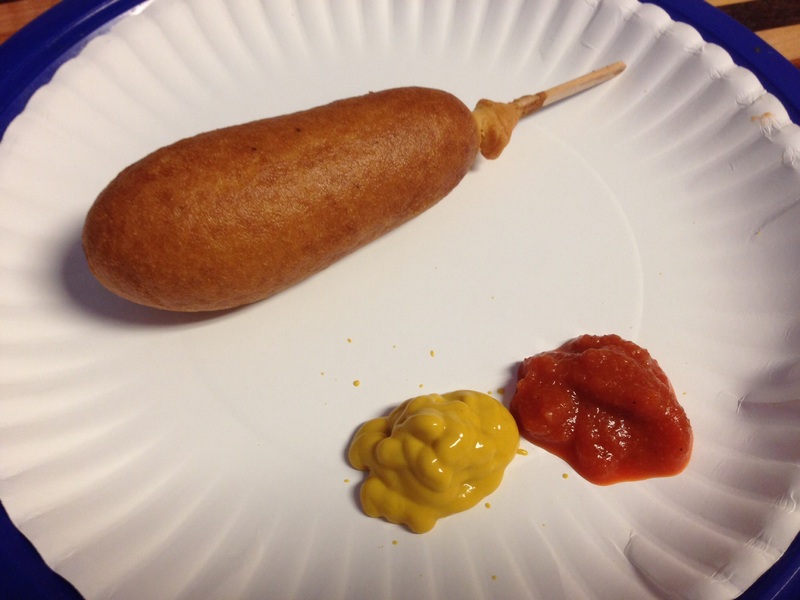 My goal for 2015 is to eat a good corn dog(possibly two) with mustard and my homemade hot sauce. Edit: oh man this thing was good. Aaron, I bet it's been longer than that for me. Yes, it looks good. I need to make some. Ok here is a list of things I have never made and would like to. The list may change throughout the year but this will be for starters. While I enjoy a good hot dog occasionally, I have never understood the popularity of corn dogs. I don't dislike them but I'd rather have my frank in a bun with mustard and sauerkraut. Also, mustard but never ketchup or relish on a frank. Personal taste and regional differences, I guess. (01-03-2015, 01:59 PM)DoctorShaveGood Wrote: Ok here is a list of things I have never made and would like to. The list may change throughout the year but this will be for starters. (01-03-2015, 02:01 PM)freddy Wrote: While I enjoy a good hot dog occasionally, I have never understood the popularity of corn dogs. I don't dislike them but I'd rather have my frank in a bun with mustard and sauerkraut. Also, mustard but never ketchup or relish on a frank. Personal taste and regional differences, I guess. Popularity? Maybe it has to do it with being on a stick. Agree about the mustard on a corn dog or hot dog. The list would be too extensive. But the cold weather brings on chili and burrito filling, as well as perogies. We can't buy the cheese locally except when Hannaford says it's OK; so we make our own. Fooey on Hannaford (yet again)! Ours is just as good or better for 1/3 the price, but it's not a summer job. When we make the farmers cheese for perogies we make a mess of it and vac pak it. (01-03-2015, 03:14 PM)ShadowsDad Wrote: The list would be too extensive. We can't buy the cheese locally except when Hannaford says it's OK; so we make our own. Make your own? Now that's one for the list. wearing a black Basque beret, drinking Tremontillo and effecting an Earnest Hemingway gravitas. If you're going to do fatties, also do scotch eggs, ...awesome! We have tied paella, but that failed, would like to try again. Aaron, farmers cheese is incredibly easy to make. Plenty of web instructions and there are far more uses than perogies. I like it with chives as a spread for bread or crackers too. Now I've put on another whole persona by just mentioning paella. I dig that. What will they call me? Yes, what are these scotch eggs? I have some Glenlivet that i can cook with if that's what we're talking!